In the 51st issue of the Bed and Breakfast e-Traveller, we take you to the province of Manitoba, the “Gateway to the West”! Explore Manitoba's rich history and diverse cultural heritage, complemented by thousands of immigrants from over 40 ethnic communities. Along the way, stop at quaint museums, enjoy a game of golf, go fishing and take in the hospitality of bed and breakfasts. With over 100 unique and enjoyable establishments throughout the province, you are in in for a memorable time! www.travelmanitoba.com 1-800-665-0040 ext. AC5. 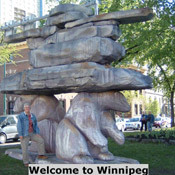 Winnipeg, a Cree word for "muddy water," is known as "The Chicago of the North." 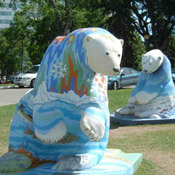 Come now to see the Bears on Broadway, some 62 seven-foot polar bears on display until October 22, 2005. Take a stroll among them before they hibernate! Gaze at the “Golden Boy" atop the Provincial Legislative Building, or take a self-guided tour of the Exchange district, a national historic site due to its rich collection of turn-of-the-century terra-cotta and cut stone buildings unrivalled in the world. This region of contrasts contains open prairie agricultural fields, wooded parklands filled with wildlife in the Turtle Mountain Provincial Park, and desert dunes in the Spirit Sands of the Spruce Woods Provincial Heritage Park. The town of Boissevain www.boissevain.ca, also a Manitoba ‘Star Attraction,’ features over 20 giant outdoor murals of historical significance, as well as beautiful floral gardens and the Turtle Island Festival, August 12, 2005. Members of Gardens of Western Manitoba are pleased to share their town and country gardens with visitors. gardenswestmb.cimnet.ca Also stop by the towns of Souris, famous for the 101-years-old free-suspension foot bridge, and Neepawa, the ‘World Lily’ capital and the hometown of Margaret Laurence. The importance of agriculture in Canada is displayed at the Manitoba Agricultural Museum located in Austin, which boasts the largest collection of operating vintage farm machinery in Canada. For a truly enriching environmental experience visit the Oak Hammock Marsh Interpretive Centre for wildlife and bird viewing. The Migration Festival, held October 1 & 2, celebrates the arrival of the many migratory species of birds that appear each fall. Churchill is situated on the shore of Hudson Bay, 1,000 km north of Winnipeg. From January to March, Northern Lights decorate the skies; from May to July, the region becomes a birdwatcher’s sanctuary; and from June to August, whales are visible in the bay! Come for the first "Gardens, Parks, & Treasures," Poker Derby on August 6, 2005. Visit the Broken Beau Pioneer Village Museum Heritage Day on Sunday, August 7th, where all antique farm equipment is working and bread is baked in an outdoor oven. For more information contact Carol at 1-204-268-3950 or download the brochure (.doc). Don’t miss the fourth WAVE Artists Studio Tour on Sept 3-4, 2005, presented by the Winnipeg Beach Art & Culture Co-op Inc. www.watchthewave.ca.